Holy Spirit changes our life but we cannot detect the spirit in action. We see similar things in nature. When zero degrees of ice is turned into zero degrees of water, energy is used but this energy cannot be detected by the thermometer. 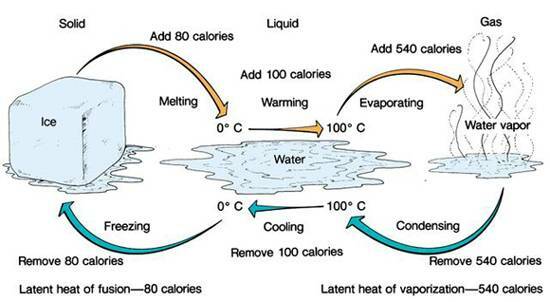 When ice melts, it remains at 0 °C (32 °F), and the liquid water that is formed with the latent heat of fusion is at 0 °C. The heat from the fusion of water at 0 °C is approximately 334 joules (80 calories) per gram. Even though 80 calories are added to zero degrees of ice, it still shows zero degrees in thermometer. Joseph Black, a Scottish chemist used the term latent heat in the context with calorimetry where a heat transfer caused a volume change while the thermodynamic system's temperature was constant. Copyright 2010 Periodictable Creation and the Bible. All rights reserved.